In my posting on post traumatic election disorder I mentioned the increased uptake of CBD as one of the many varied options that could help with the anxiety and dread. Many have written me wondering what CBD is. My article was written with humor and seriousness. After the legalization of cannabis in Oregon in 2015 I decided to study up and found some interesting things. The cannabis plant has 489 distinct compounds and at least 100 cannabinoids. The two main ones most people are concerned with are THC (tetrahydrocannabinol) and CBD (cannabidiol). THC binds to CB1 receptors (concentrated in the brain, central nervous system, some nerves and some other organs) and CB2 receptors (mostly in peripheral organs, especially cells associated with the immune system). The psychoactive effect, getting high, is largely the result of THC activity at the CB1 receptors. CBD does not directly fit into either of these receptors but does block THC at the CB receptors which may decrease some of THC side effects such as anxiety. CBD has direct interaction at the opioid receptors helping with pain and addiction; at the dopamine receptors helping with addiction and depression; and at the serotonin receptors which may help with addiction, anxiety and depression. Since CBD does not bind to the CB1 receptors it does not get you high. Since legalization many people in my practice report and talk about their use of medical and recreational cannabis. For some taking a pure CBD cannabis or ones that have a high ratio of CBD to THC may find help with anxiety. Other medicinal properties of CBD include reducing inflammation, relieving pain, reducing seizures, fighting heart disease, inhibiting cancer cell growth, suppressing muscle spasms, reducing nausea, antibacterial & antipsychotic, relieving anxiety, regulating immune system activity, reducing cramps, protecting the nervous system from degeneration and regulating blood sugar levels, to name a few. 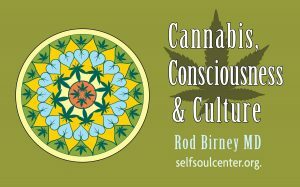 I have presented my talk Cannabis, Consciousness & Culture twice locally and will be presenting at the Creativity & Madness Conference in Santa Fe next summer on this theme. I hope this clarification is helpful.